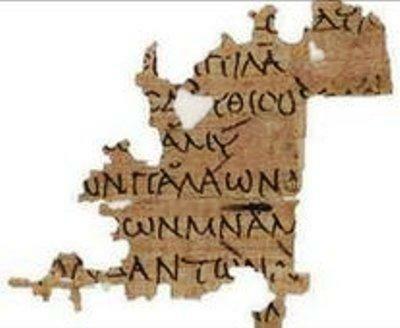 The papyri contain literature, letters and even a story about how Jesus Christ cast out demons. Scholars have been studying the Oxyrhynchus collection for more than 100 years and have already rediscovered many lost works that went missing during medieval times. They have found masterpieces by the ancient Greek poet Sappho and dramatists Menander and Sophocles. Many of the documents the public can see on the site have not been read for more than 1,000 years. But although they are written in Greek, visitors to the website do not have to have any knowledge of the language in order to use an online tool to help analyse the fragments. One letter, written in 127 AD, which has already been translated is from a grandmother called Sarapias asking that her daughter is brought home so that she can be present at the birth of her grandchild. Project director Dr Dirk Obbink said: "We aim to transcribe as much as possible of the original papyri, and then identify and reconstruct the text. "No single pair of eyes can see and read everything. From scientists and professors to school students and ancient enthusiasts, everyone has something to contribute - and gain."